Because of that, I entered my screening of 1956’s Forbidden Planet with some trepidation. 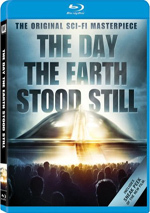 The Fifties offered at least one other example of good sci-fi via 1951’s The Day the Earth Stood Still, but I find it hard to think of other quality efforts in the genre. Still, this release sounded enticing, so I decided to give Planet a shot. 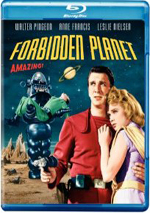 Forbidden Planet appears in an aspect ratio of approximately 2.35:1 on this Blu-ray Disc. While not stellar, I felt pleased with the visuals. Overall sharpness seemed good. The majority of the film appeared concise and accurate. When I noticed exceptions, they almost always stemmed from visual effects shots; those could be a bit soft due to the nature of their creation. Most elements looked well-defined. Jagged edges and shimmering created no concerns, and I detected no signs of edge enhancement. Source flaws were fairly minor. Occasional examples of specks and blemishes occurred, but these remained reasonably infrequent and never became a big problem. Colors never dazzled, but they worked fine. The movie tended to go with a subdued greenish palette, and the hues appeared reasonably accurate. At times they were a bit bland and messy, but they usually represented the source in an acceptable manner. Blacks were decent, they exhibited fair depth and presence, while shadows appeared fairly concise. The transfer was good enough for a “B”. I also felt pretty pleased with the DTS-HD MA 5.1 soundtrack of Forbidden Planet. Audio quality was usually good for its age. Speech sounded somewhat brittle at times, and I noticed occasional muddiness as well. Still, the lines were always intelligible and without significant concerns. The “electronic tonalities” were full and distinct. They showed good life and breadth throughout the film. Effects followed suit, as they were clean and pretty powerful. The handful of louder segments demonstrated nice depth and impact. Though not terribly ambitious, most parts of the soundfield succeeded. I thought the “tonalities” spread well across the front and rears to create a reasonably immersive presence, and effects featured good localization. Various elements popped up in appropriate spots and blended together pretty well. Surround usage wasn’t heavy, but the back speakers added to the sense of place. The movie also featured a lot of directional dialogue, and that side of things wasn’t always successful. Some lines appeared well-placed, while others were less effective. Nonetheless, the localization was never bad or distracting, as the speech blended with the rest of the mix in a decent manner. Like the visuals, I thought the audio merited a “B”. How did the picture and sound of this Blu-ray compare to the 2006 Special Edition DVD? Both showed improvements. I found much fault with the sloppy localization of the DVD’s dialogue, while the Blu-ray tightened up that side of things and also boasted a little more punch. The image also stepped up in quality. I thought the DVD could be soft, and I felt its colors looked flat and faded. The Blu-ray was consistently stronger in both regards and presented a consistently superior picture. Across the board, the Blu-ray topped the DVD. The Blu-ray includes all of the extras from the 2006 DVD. We start with 12 Deleted Scenes. Taken together, they fill a total of 13 minutes and 11 seconds. Fans who hope to find anything major will feel disappointed, as these bits and pieces are pretty inconsequential. The most significant shows some interpretation of Alta’s effect on animals. I’m sure Planet aficionados will be delighted to see these clips, despite their forgettable qualities. In addition, we get nine minutes and 15 seconds of Lost Footage. We see various pieces of test footage that include various effects elements. I suppose the Planet buffs might dig them, but they bored me. Two clips show up under the banner of MGM Parade. We get excerpts from Episodes 27 and 28 of a mid-Fifties series by the same name. Together the two snippets add up to six minutes, 11 seconds. Walter Pidgeon hosts these pieces and gives us a look at Planet. “27” is essentially just a promo for the flick, but “28” offers a cute little chat between Pidgeon and Robby. These are worth a look for their enjoyable archival value. For a major attraction, we go to The Invisible Boy. This 1957 feature film lasts 89 minutes and 22 seconds. Why does the flick appear in this set? Because like “Robot Client”, it features Robby. In addition to Boy, the set includes three separate documentaries. First comes the 55-minute and 27-second Watch the Skies! : Science Fiction, The 1950s and Us. Narrated by Mark Hamill, it mixes archival materials, movie snippets, and interviews. We find notes from filmmakers Steven Spielberg, George Lucas, Ridley Scott, and James Cameron. The program examines the significant sci-fi flicks of the 50s and how they reflected their era. We also look at a mix of trends in the genre, and we learn about how the movies dealt with science fact and used different elements as metaphors. Finally, we encounter two trailers. We get ads for Planet and Invisible Boy. 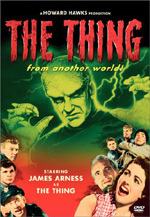 This becomes the only loss among the Blu-ray’s extras; it drops promos for The Thing from Another World, The Beast from 20,000 Fathoms, Them!, The Black Scorpion, and the 1960 version of The Time Machine. It’d be good enough if Forbidden Planet merited attention solely due to its influence over 50 years of science fiction. However, the movie also continues to entertain. The Blu-ray provides pretty good picture and audio along with a satisfying complement of supplements. 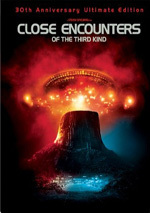 I feel quite pleased with both the film and this release and recommend it to sci-fi fans. That goes for the folks who already own the 50th Anniversary DVD; with its visual and sound improvements, it becomes a nice upgrade.